Department of Public Relations and Publicity, Faculty of Communication, Istanbul Aydın University, Istanbul, TURKEY. Department of Religion, Temple University, Philadelphia, USA. Department of Psychological Foundation, Abia State University, Uturu, NIGERIA. Department of Psychological Foundations, Abia State University, Uturu, & Ihechiowa High School, Arochukwu Local Government Area,Abia State, NIGERIA. 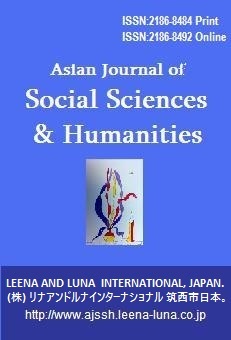 Social Determinants of Health Researches Center, Yasuj University of Medical Sciences (YUMS), IRAN & Department of Communication, Faculty of Modern Languages and Communication, University Putra, MALAYSIA. Department of English language, Islamic Azad University, Tonekabon Branch, & Department of English language, Islamic Azad University, Chalus Branch, IRAN. Ushie, M.A., Abia, R.P., Archibong, E.P. , Nsemo, A.D.
Department of Sociology, & Department of Nursing, University of Calabar, NIGERIA. UOM, Chakdara, Dir Lower, Institute of Islamic and Arabic Studies, University of Peshawar, AWKUM, Mardan, PAKISTAN. Central Scientific Library, National Academy of Sciences, AZERBAIJAN. Department of Mass Communication, Gomal University D. I. Khan, PAKISTAN, & College of Applied Sciences, Nizwa, Ministry of Higher Education, OMAN. Department of Education, Allama Iqbal Open University, Islamabad, & Department of Anthropology, Quaid-i-Azam University, Islamabad, PAKISTAN. Institute of Islamic and Arabic Studies, University of Peshawar, UOM, Chakdara, Dir Lower, & AWKUM, KPK, PAKISTAN. Faculty of Social Science,University Malaysia Sarawak, Samarahan, MALAYSIA. National Centre, Zimbabwe Open University,Harare, ZIMBABWE. National Centre, Zimbabwe Open University, Harare, ZIMBABWE. Department of Applied Psychology, University of the Punjab, Lahore, PAKISTAN. Department of English, Islamic Azad University, Tonekabon Branch, Chalous Branch, Qaemshahr Branch, & Mazandaran University, Babolsar, IRAN. Department of English language, Islamic Azad University, Chalus Branch,&Tonekabon Branch, IRAN. De la Salle University-Manila, Philippine Normal University-Manila, St. Joseph’s College-Quezon City, & University of the Philippines, PHILIPPINES. AMA International University-Bahrain, Kingdom of Bahrain, UAE. Department of Educational Management, Adekunle Ajasin University, Akungba-Akoko, Ondo State, NIGERIA. English Department, Tai Solarin University Of Education, Ijebu-Ode, Ogun State, NIGERIA. Institute of Islamic and Arabic Studies, University of Peshawar, UOM, Chakdara, Dir Lower, AWKUM, Mardan, & Department of Islamic Studies, KUST Kohat, PAKISTAN. Egerton University, Egerton, & Kenyatta University, Nairobi, KENYA. De La Salle University-Manila, PHILIPPINES. Department of Geography and Environmental Management, University of Ilorin, Kwara State, & Department of Geography, Emmanuel Alayande College of Education, Oyo, NIGERIA. Literacy for Family Health Initiative, National Trust for Population Welfare, Islamabad, & Quaid-i-Azam University, Islamabad, PAKISTAN. Department of Economics, & Department of Education, Gossaigaon College, Kokrajhar, Assam, INDIA.